Jess at I Heart Recess created this linky, and I love goal setting so much that I decided to give this kind of thing a try. That and I LOVE anything in rainbow colors. Personal: My girls are growing up so fast, and I want to be with them more, and not just sitting next to them working. I want to engage with them more, enjoy what they are doing, and just hang out more in general. Organization: I was a reluctant transfer to Google Drive, but I am now hooked. I still have two shelved of massive three ring binders behind my desk. I would love all my great stuff in one folder on the computer that I can access anywhere. Planning: I always seem to run out of time with my seniors. 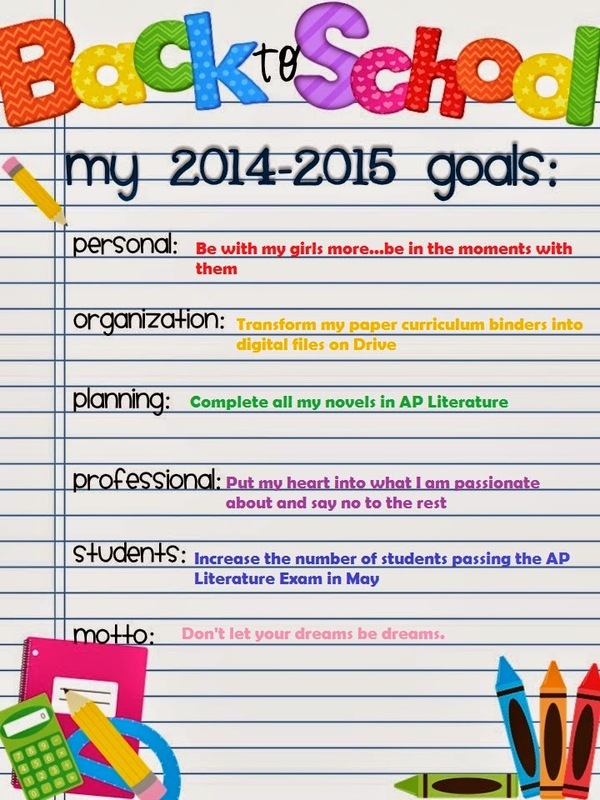 I have been proactive so far in my planning to make this goal a reality. My students need more novels under their belt. Professional: This connect to my personal goal in that I need to say yes to less things at school. I need to pick two or three and do them really well. Last year I had too much on my plate second semester. Students: I had 91% of my AP Psychology pass the psychology exam this year, and I want to push my AP Literature numbers in that same direction. Motto: I have things that I want to do (this blog is one of them), and I refuse to let them remain dreams.